Happy Herbs Italian Vinaigrette is no ordinary Italian salad dressing. 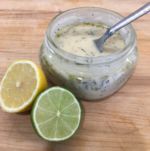 This creamy herbal vinaigrette has a beautiful bold flavor with its mixture of simple, healthy ingredients: miso, hummus, white balsamic vinegar, lemon, lime, olive oil and Herbes de Provence (thyme, fennel, basil, savory, lavender). Enjoy on traditional greens with tomatoes, red onion, carrots and sunflower seeds, or with your favorite salad creation. Also enjoy as a vegetable dip by using a little less vinegar to thicken it. Here’s to your health and culinary enjoyment! 1/4 cup hummus We use the Kirkland (Costco) single serve organic hummus.They come in a box of 20 in the refrigerated section. They are awesome to take with veggies when you are on the run. Mix all ingredients in a bowl. Serve immediately over greens or refrigerate for a few hours to allow flavors to blend. Use a little less vinegar for a thicker veggie dip. Stores well in fridge for days.